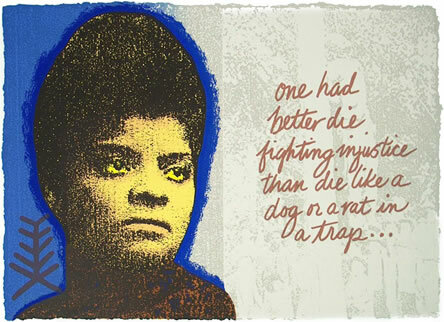 On Thursday, in honor of the incomparable Ida B. Well’s birthday, Google featured Ms Wells as their doodle of the day. As a teacher, editor, writer and advocate against social injustice, Well’s leadership, despite implemented decades ago offers invaluable advice in how to tackling contemporary battles. Thus, In remembering Ida B. Well’s contribution to the culture, the Whispers of Womanism presents four things contemporary society can learn from the leadership of Ida B. Wells. While many know Ms. Wells as an editor and activist, few know that she actually preceded Rosa Parks. Despite purchasing a first class ticket, Wells was ordered to seat in the Jim Crow section. Incidentally, the Jim Crow section did not have first class, so Wells refused. The conductor then makes an attempt to physically remove Wells who in turn bites the back of his hand. While she was eventually removed from the train, she was forever implanted in history as tirelessly devoted to justice. After being fired from her job, she became a full time journalist. As the co-owner and editor of The Free Speech and Headlight, Wells created a platform to educate the public of black injustice. From systematic disenfranchisement to social issues, Wells spoke out against the system that oppressed her. Following the lynching of her close friend, Wells devoted her newspaper platform entirely to outing whites for the inhumane and unjust lynching of blacks. In addition to starting her own newspaper and launching the anti-lynching campaign, Wells co founded the NAACP in 1909. By starting and maintaining platforms dedicated to the injustice faced by blacks, Wells disrupted the silence of white supremacy with uninhibited truth. While many regarded the philosophies of Washington and Dubois as the two founding philosophies of the 20th century, Wells begged to differ. In her failure to nod along with Washington and Dubois, Wells forged her own path. Like countless others who dared to take a stance, Wells faced numerous threats amongst countless acts of terror. These occurrences failed to thwart her ambitions, as Wells continued to work with purpose overseas. In fact, Wells moved to England to continue her anti-lynching campaign following the torching of her beloved newspaper and numerous death threats. This act, while simple on the surface demonstrates that while you can torch a house you cannot destroy its foundation. Through perseverance and purpose Wells epitomizes the determination, tenacity and effectiveness of speaking and acting out against injustice. As a testament to the power of self liberation through purpose, Ms. Wells is the ultimate revolutionary and symbol of leadership.